, a new book out that pretty much is how we live – mostly vegan but with a “flexitarian” view on eating. The publisher, Adams Media, has printed a number of books on cooking (of which I have received quite a few copies of books for review, along with this book as well). The authoress is Cherise Grifoni who has a good sarcastic sense of humor. Let me say I like that kind of personality! (See here for a good example – and might I add that is exactly the snarky reply I would give!) If you get a chance do pick up her new book and give it a look over. I am sure you will find something you crave in it – for the most part she avoids hard to find ingredients and the recipes are of foods one would find “normal” – lest I tell you all the story of the grossest meal I ever made when I was 13 that involved a block of tofu, carrots and noodles – which wasn’t normal. Can I just say I love the new breed of vegan cookbooks that are exciting and flavorful? PS: While the book isn’t fancy (no photos at all) it is heavy on recipes and even better is printed in the US (yes, that is a big + for me when I see that!). And so for dinner tonight we had this delicious and tasty dinner – served over baked brown rice with steamed green peas on the side. Even the baby loved it! In a small bowl whisk the soy sauce, orange juice, vinegar, maple syrup and red pepper flakes together. In a non-stick skillet heat the oil over medium heat, add in the tofu and garlic and cook for 2 minutes or until the tofu is lightly brown (kind of golden). Add in the orange juice mixture and turn down to medium-low. Let simmer gently for 8 minutes. Meanwhile stir the cornstarch and water together until smooth. Slowly add to the skillet, stirring while you pour it in. Let simmer for 4 minutes longer, stirring often. 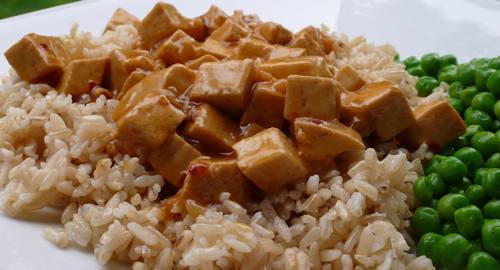 Serve the sauce over the brown rice.